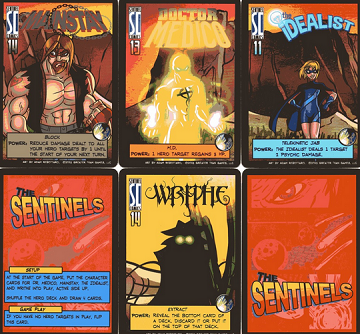 Adding a fourth major expansion, the Sentinels of the Multiverse’s train continues to plow through the competition. But this expansion goes where no Sentinels of the Multiverse expansion has gone before; a team of superheroes facing off against a team of supervillains. We’ll get to the superhero action in a bit but first, let’s get to the nitty-gritty. 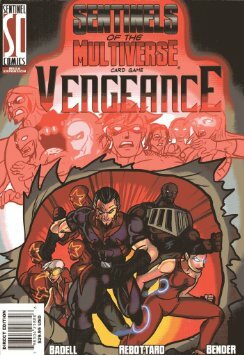 Sentinels of the Multiverse: Vengeance is the fourth expansion for the popular comic book themed card game. I won’t go into detail how the base game usually flows. 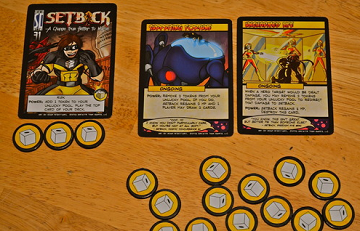 If you didn’t catch our Sentinels of the Multiverse: Base Game review, you can read it here. In short, Sentinels of the Multiverse is a cooperative card game, where players team up with each other to beat the stuffing out of a super villain—which has a dummy hand similar to Bridge. The major change in Vengeance is the inclusion of supervillain team mechanisms. Instead of having a villain turn and then the heroes taking all of their turns, Vengeance has one villain take their turn and then a hero and then another villain takes a turn and then another hero and so on, until all villains and heroes have taken their turns. Play then shifts to the environment as usual and after the environment takes its turn, the process begins again. 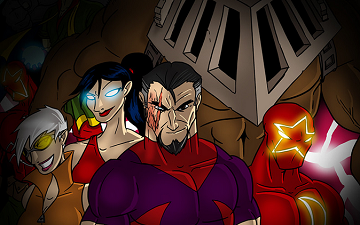 The inclusion of a villain team shakes up Sentinels of the Multiverse more than any other expansion. The mechanisms play smoother and faster than you’d expect, add another level of difficulty missing from previous expansions, and work with the theme of superhero/supervillain fights as many comics have supervillain teams. But don’t be fooled. None of these villains are any good on their own. They’re meant to be played all at once. I would’ve liked some standalone villains, but this is a small gripe. Another small grievance is that the environments are bland and on the light side. This might be because you need an easier environment when you face five villains, so I dig that, but surprisingly, the heroes in Vengeance shine. I expected great villains in this set, but the heroes add a lot to the overall gameplay. I love mechanisms that have you sacrifice something in order to get something and ones that press your luck. Setback’s mechanisms fit both of these criteria, so I can see him as one of my new favorite sentinels. And speaking of Sentinels, the mini-team The Sentinels allows you to control a lot of smaller heroes, which gives you plenty of options and options are a great thing to have, but I’ve even played five heroes with three players before and that’s where The Sentinels come in handy. Three players controlling five heroes used to mean that one person played one hero, while the other two players played two. With The Sentinels you can play the game in this manner and all three players get to play multiple heroes. Greater Than Games must be reading their fan messages, because I’m not the only one who plays the game like this. The other heroes in this set are great as well. The Naturalist has interesting animal form mechanisms—and that fills a common superhero trope—while Parse fulfills another major superhero archetype, the archer. Sentinels had to include an archer with the popularity of Green Arrow and Hawkeye at all-time highs. Overall, Vengeance is a great expansion that builds on superhero mythos and the game’s mechanisms. While I’m tempted to say that Vengeance is the best Sentinels expansion, I think Infernal Relics keeps that title by a smidge, but you’ve got to love the direction Sentinels of the Multiverse is headed.